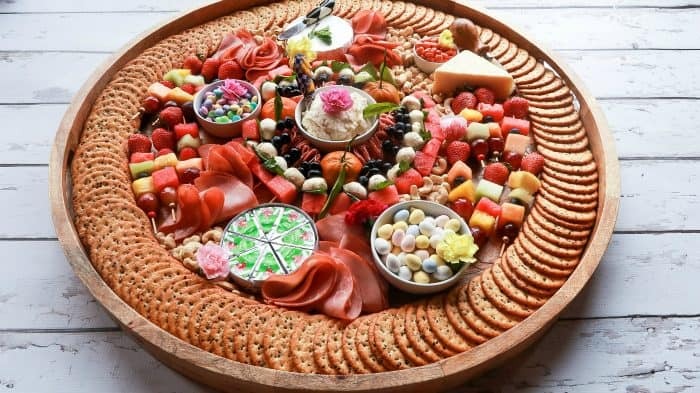 An Epic Spring Charcuterie Board filled with cured meats, cheese, fruit kebabs, and spring blossoms! 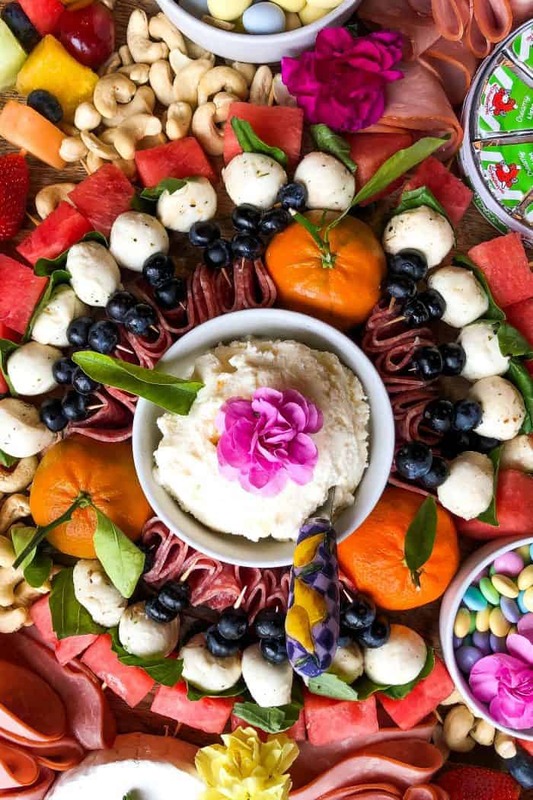 Arrange on an epic board, with favorite pastel colors! April is the time to stop chasing peak moments, to savor the little ones instead. I mean little ones, like watching the sunset, going on a short hike, hopping on the bike, or taking flowers to a friend in a jar for a visit. How about writing letters or sending cards, and gathering your people together for a potluck meal? 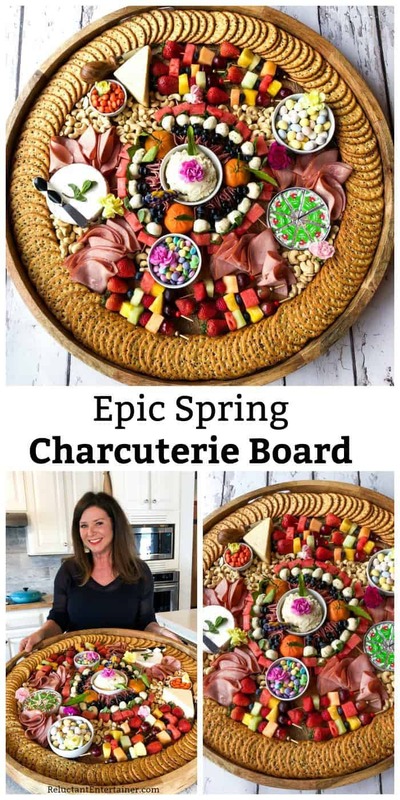 Even for this board, ask your friends to each bring a spring food, and make a charcuterie board together! Poo-poo those excuses, Friends. If you’re hosting a dinner, ask everyone to contribute to the meal so you don’t have to do it all! 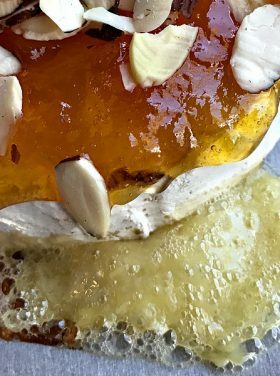 Let me just mention, if you have not tried this Apricot Honey Fromage Blanc (above) from Costco, OH MY GOODNESS. It’s fantastic. A crowd-pleaser for sure. I even served it on this Mandarin Mixed Green Salad last week for dinner guests! Here’s what I love about serving an epic board. And this goes for all my charcuterie boards here on RE. It immediately brings people together and creates a fun conversation. 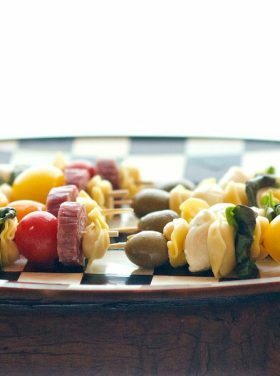 Finger foods are always welcoming and make mingling super easy. You can arrange the board ahead of time (or leave space for the last minute items), and move on to your next task. Think about a theme or holiday, which foods go together, and write out your list. Shop and create. It’s easy! 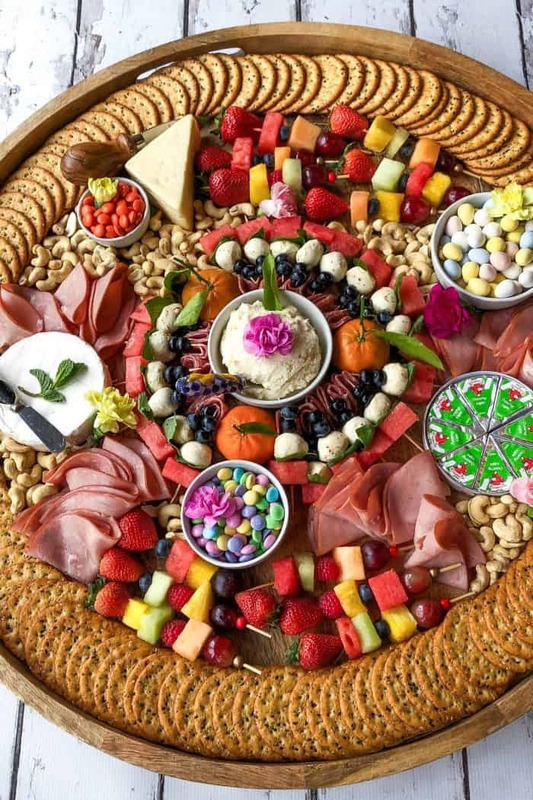 Also, for Easter, I love how the “deviled eggs” are the main appetizer for this Easter Charcuterie Board! 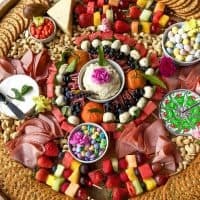 Everyone asks about epic charcuterie board! I bought this board at Pier One a couple years back, but you can use any board. You can view all my “epic charcuterie/cheese board” ideas, here. My board is 28 inches wide and 2 inches thick. It’s super important to have a “lip” on a board that is going to be epic, so the food doesn’t fall off. Or, use two boards. It’s also fun to set out three food arrangements. I also seasoned my board by lightly sanding it down, and then rubbing it with beeswax and mineral oil. Like you would season any board. Easy! Prepare a large board with parchment paper (unless food safe). In the center of the board, place a premier cheese (I used Apricot Honey Fromage Blanc from Costco). Next lay down the watermelon skewers. 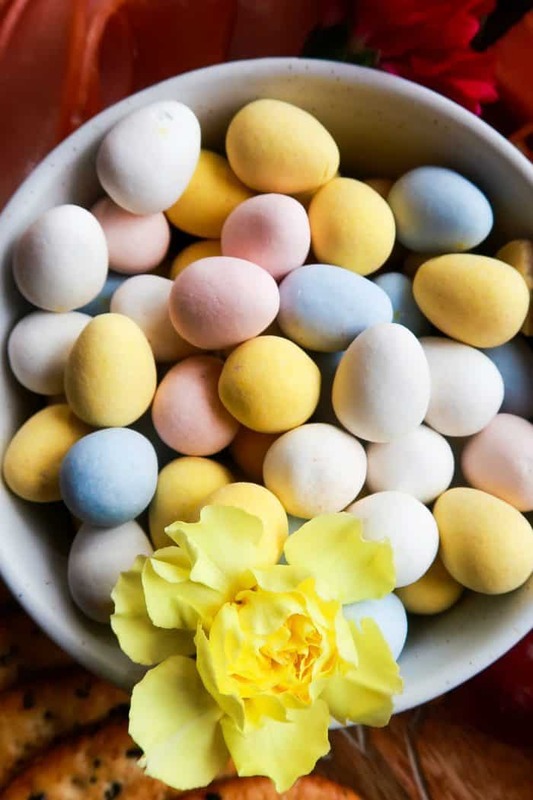 Place on the board bowls of Easter candy and the cheese (hard cheese, brie cheese, laughing cow wedges). 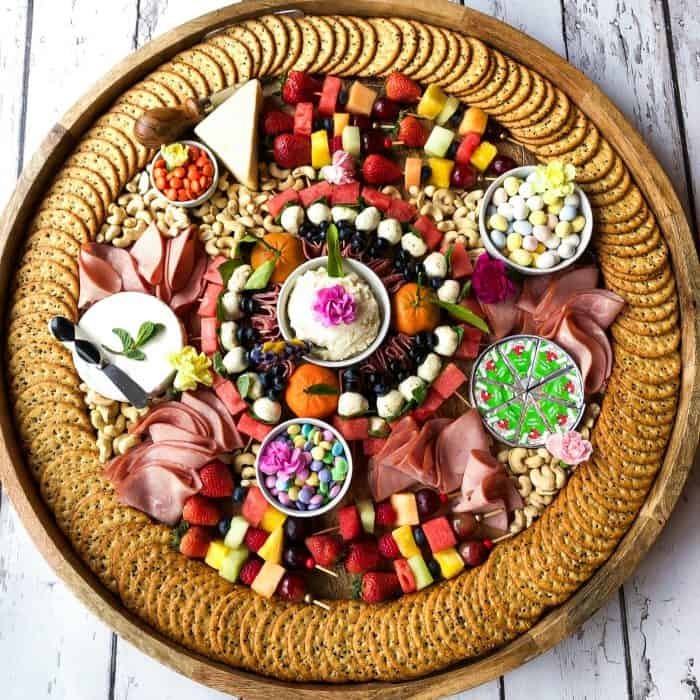 On the outside of the board, fan (spread) the mutli grain crackers. 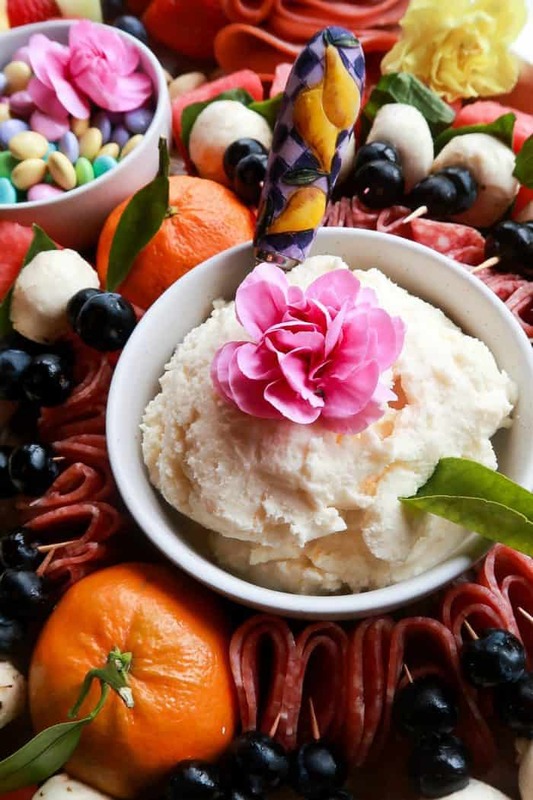 Lay down the fruit skewers and folded over pieces of ham. 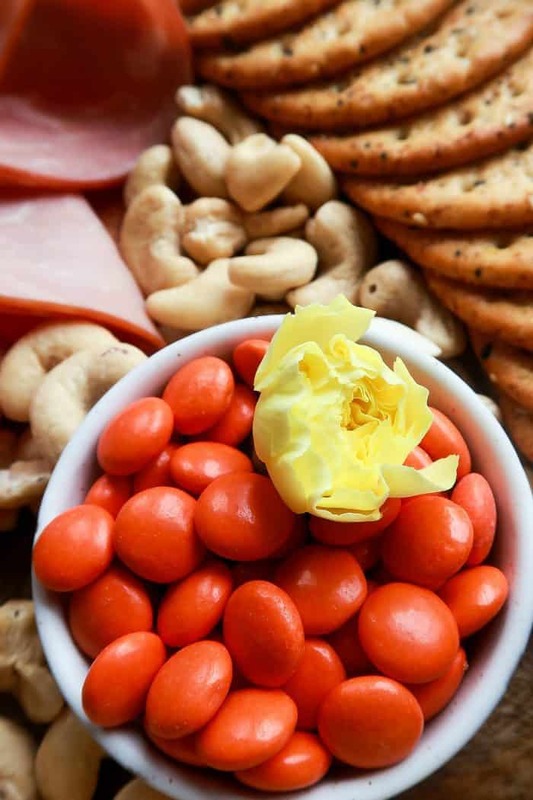 Fill in the open spaces with whole cashews! 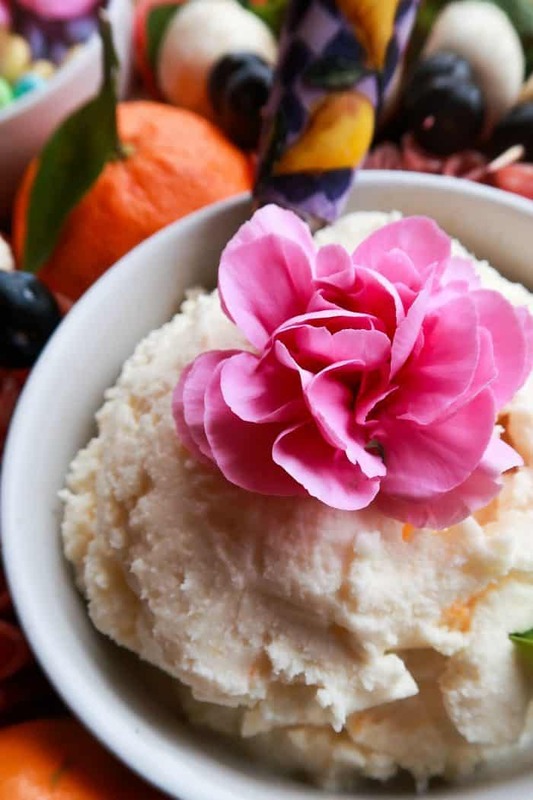 Garnish with spring flowers and fresh basil or mint. I like to remember the way my mother would host. Every holiday of course, but believe me, also many weekends in between the holidays. 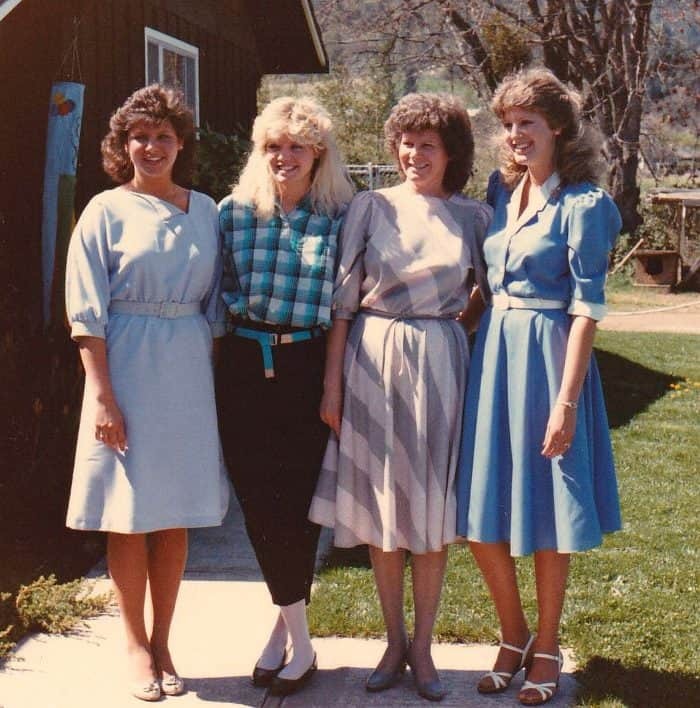 My mom … I love this photo of mom with her daughters, with our Easter-egg colored clothing in 1983. No wonder, as I still search out the lines of mom’s beautiful smile, what I feel, all over again, is that sense of deeply rooted hospitality and love that kindled our mother/daughter relationships. Except for now, mom has been gone for 21 years. Which brings me back to chasing the little moments, the here and now. Creating a space where people can come together. 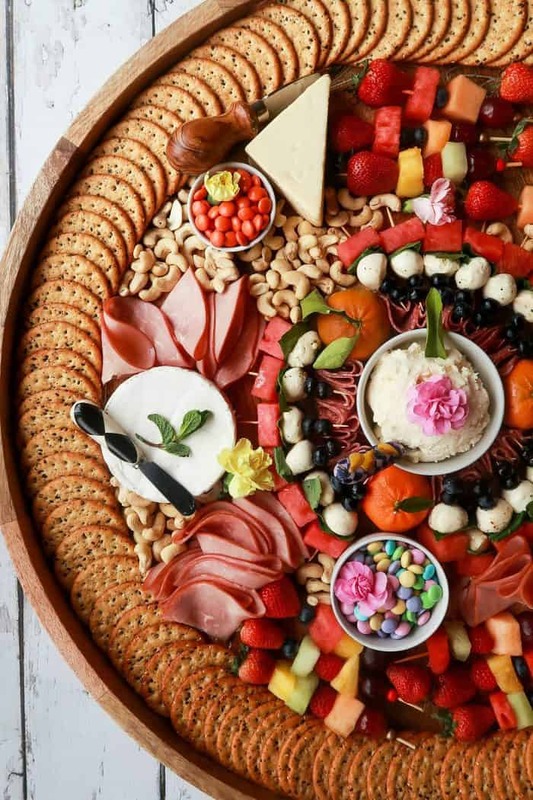 Every meal takes on a flavor of its own, though we do not serve this epic board for every hosting event in our home. We host all kinds of ways. 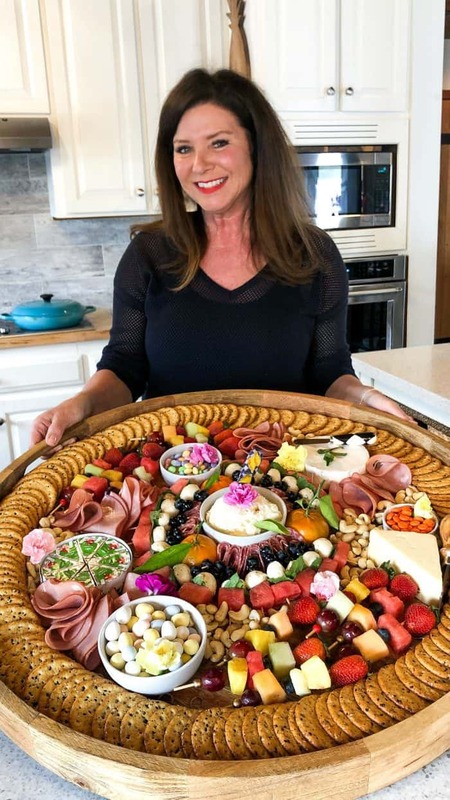 My charcuteries are here to inspire my readers to more hospitality, love, and bonding with your people! 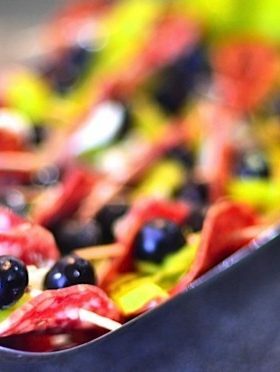 Also fun for a spring board, Baker Mama’s Magic Mix, Greek Salad Skewers, and these 4th of July Blueberry Caprese Skewers. Arrange the 3 tangerines (with stems) for garnish, next to the center bowl. In between place "salami flowers." 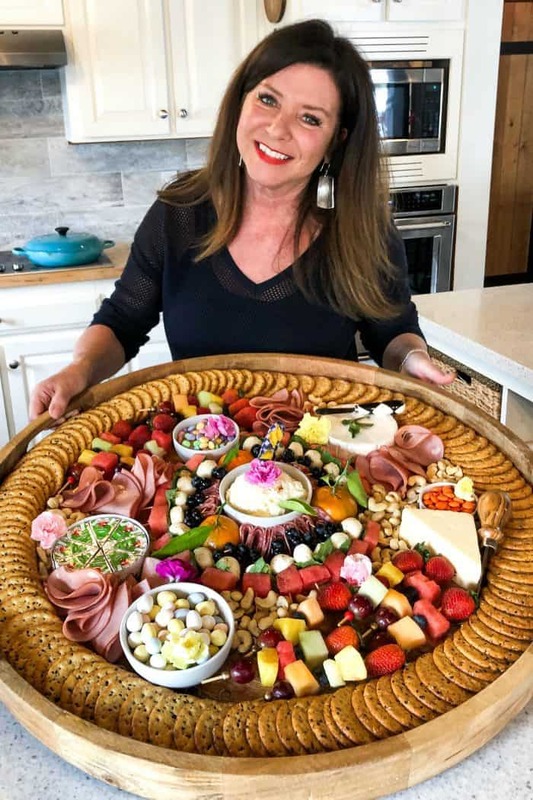 Appetizers Charcuterie/Cheese Board Entertaining Holiday Foods Holiday Parties Hospitality Parties Recipes Relationships Seasonal Spring Why Reluctant? 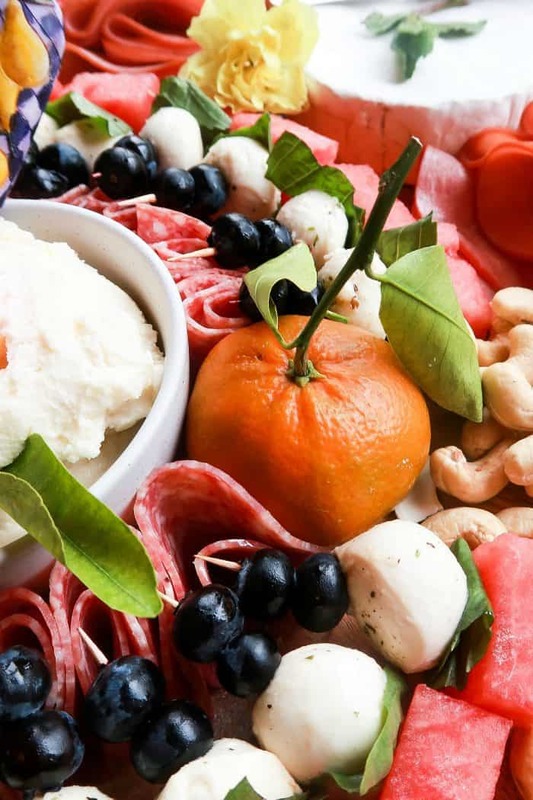 I love this detailed explanation of how to create the perfect charcuterie board! Can you tell me the diameter of the board you used and perhaps where I could purchase that one? Love it. 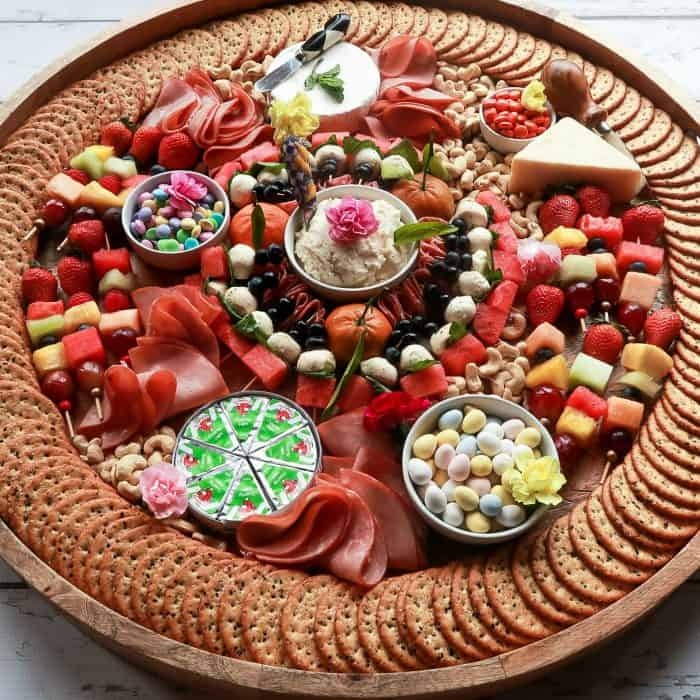 I’m always keeping my eye out for something unique and awesome and reasonable…lol to use as a charcuterie board…would be fun to try making some. Perfect for simple get togethers. That is EPIC! In looking at them, all of your boards are. Thanks for the inspiration, I always enjoy charcuterie!